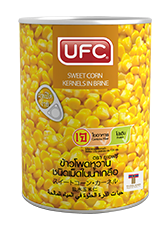 UFC Sweet Corn Kernel in Brine carefully selected fresh sweet corns with kernels removing are placed in brine to preserve its flavours, textures and nutrients. A flavorful product with plenty of nutrition. The ready to use corn kernels make cooking even more convenient and yet maintains the favors in all dishes. Suitable for use in both savory and sweet such as fried corn patty, sweet corn salad, sweet corn soup, eclair stuffed with sweet corn, sweet corn with sago. UFC sweet corn kernel is easy to use yet provides dishes with a flavorful taste.